On the 24th of April the Maritime CIO Forum returns to Hamburg. Stop by and experience ship management in the cloud. On the 24th of April the Digital Ship Maritime CIO Forum returns to Hamburg. During several presentations and sessions, the event will address the latest trends and technologies in maritime and show potential ways of harnessing their potential. We will be exhibiting at booth 17, presenting our cloud-based ship management solution, the Cloud Fleet Manager. Shipping is waking up to a new age where digitalisation is re-shaping the world and creating increased opportunity for development and innovation. Revolutionary concepts plus the evolution and advancement of existing platforms are providing unparalleled growth opportunities for shipping and related transport and supply chain infrastructure. But achieving digital success requires knowledge and understanding, and an ability to drive your company's digital thinking and transformation rather than be driven by it. Returning to Hamburg in April, the Maritime CIO Forum will investigate how we can harness these opportunities and will debate which are going to stick and really make a difference. We will ask how we can identify the real digital legacy in front of us and truly re-define digitalisation in maritime and transport. Corresponding to the topic “Big Data Platforms and Collaborations” we are going to present our all-in-one solution for efficient fleet management, the Cloud Fleet Manager. 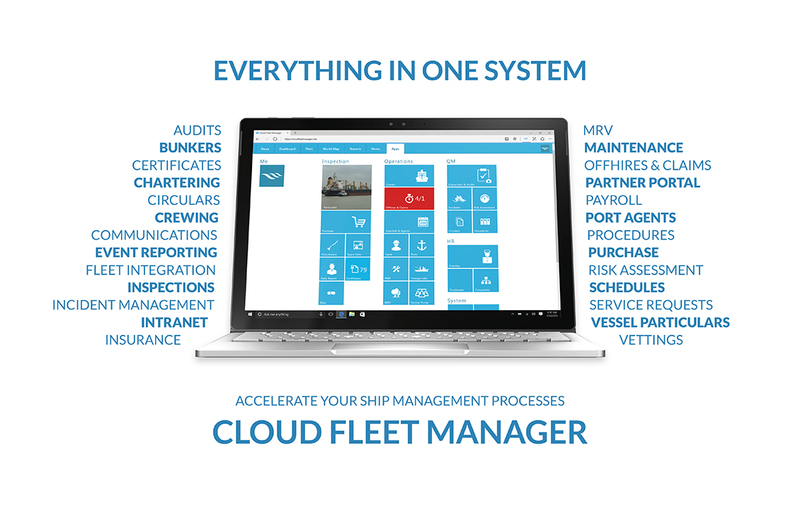 The Cloud Fleet Manager and its applications are tailor-made for shipping companies, create better internal structures and increase data quality. The software is used intuitively, additional staff training is unnecessary. This way, fleets, employees and processes can be administered in an integrated environment. The management and organization solution with its numerous applications assures the efficient operation and a flexible expansion of shipping companies. Additionally, it enables both employees of shipping companies, external agencies and crews on the high seas to work interconnected and to interchange in real-time. The software suite comprises more than 25 applications, among others: Purchase, Inspections & Audits, Schedule & Agents, Crewing, Charter, Risk Assessment, Maintenance and the Cloud Ship Manager. If you would like to learn more about our solutions simply get in touch or visit us at the DS Hamburg at booth 17.